Br. 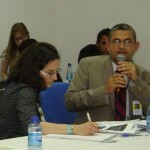 Jose de Jesus Filho, OMI represented the Catholic Prison Ministry of Brazil in discussions at the 12th United Nations Congress on Crime Prevention and Criminal Justice held in Salvador, Brazil from 12-19 April, 2010. Nearly all countries sent delegations to the Congress. The draft declaration will be finalized in May at the UNODC in Vienna, and presented to the 19th UN Commission on Crime Prevention. In accordance with the Brazilian Government, the International Prison Ministry promoted an exhibition of paintings by prisoners from all over the world. The National Secretary of Justice Romeu Tuma Jr., along with the President of the International Commission on Prison Pastoral, Christian Kuhn, inaugurated the show with a nice reception. Prisoners were present also through a theater piece called “Bizzarro” promoted by the National Penitentiary Department. The creation of a Convention met resistance from some countries like the United States and Canada, which do not welcome the idea of a new Convention. However, most countries in Latin America are in favor of the idea, because this would be an effort to improve the conditions of incarceration in these countries.